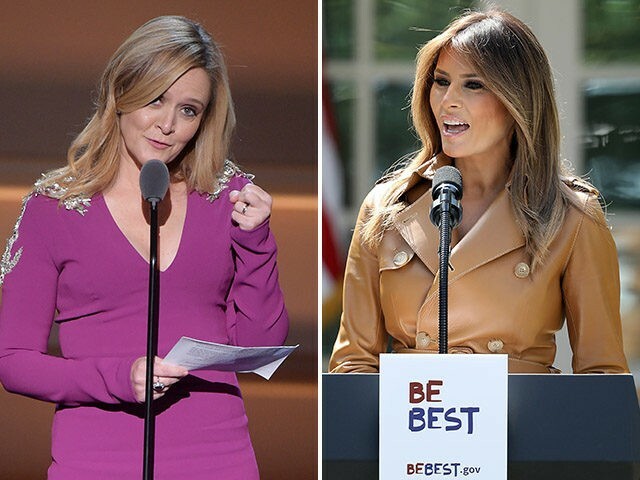 Stephanie Grisham, Press Secretary and Communications Director for First Lady, issued a statement on behalf of Melania Trump Thursday in response to comedian Samantha Bee’s vulgar attack on Ivanka Trump. “Time and again the Trump family and members of this Administration are subjected to false reporting, hateful rhetoric and outrageous lies all in the name of freedom of speech or comedy, yet the main stream media stays silent,” Grisham said in a statement. The TBS late-night host branded President Trump’s eldest daughter a “feckless c**t” after Ivanka Trump posted to Twitter a photo of herself holding her son. After a massive backlash prompted by the profane remark, Bee tweeted an apology. “I would like to sincerely apologize to Ivanka Trump and to my viewers for using an expletive on my show to describe her last night. It was inappropriate and inexcusable. I crossed a line, and I deeply regret it,” the comedian said. Statement from TBS: “Samantha Bee has taken the right action in apologizing for the vile and inappropriate language she used about Ivanka Trump last night. Those words should not have been aired. It was our mistake too, and we regret it.” And…scene. However, neither Turner nor its parent company Time Warner have indicated that CEO Jeff Bewkes will follow the lead of Disney CEO Bob Iger, who personally called Valerie Jarrett to apologize for a tweet from Roseanne Barr, who then worked for Disney subsidiary ABC.